LARP, has come up and will continue to come up on my blog with great frequency. 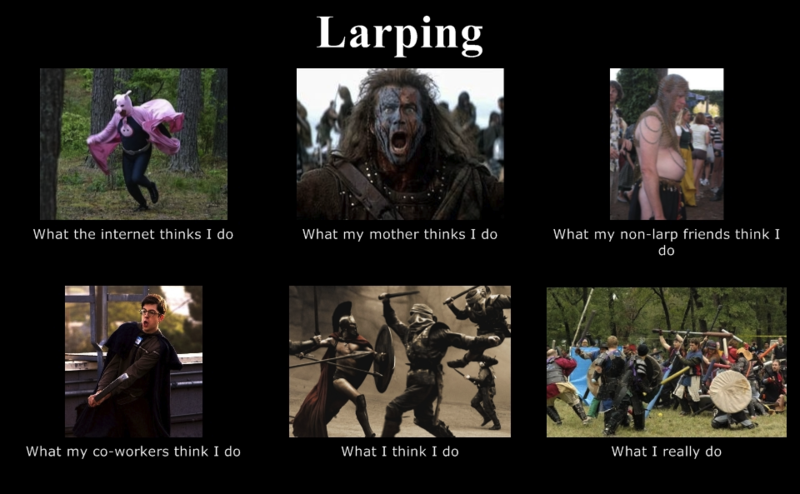 For those of you just joining me, who may not already be familiar: Larp stands for Live Action Role Playing. I like to call it a grown up way of playing pretend, but there is so much more to it than that; and it’s totally not just for actual adults but also those kids who have the patience and commitment to let there be rules involved in their pretending. LARP is what got me started on this crazy path; my personal fusion of storytelling through word and drawing into cloth and being. There are too many games to shout out; the ones I’ve played include Empty Thrones, Dying Kingdoms north and south, Twin Mask, and arguably a Dalas TX proto Belegarth group that I’m not sure if it still exists. There are countless more LARPS that I’ve never been to or even read about, all over the world. It’s pretty amazing. One of the big things that hooked me immediately about LARP is that every sense can be used to tell the story. Not only does the appearance of a character or a monster have the capacity to tell you a lot about them, but as a player, wearing and carrying the character’s accouterments is a way of telling that character’s story back to yourself. By collecting a kit of things around your character, and giving them small stories, you not only give yourself more tools to keep your character in mind, but you open up opportunities for discussions with others, “why do you carry that dead rat everywhere?” “How can you stand wearing so many layers in this heat?” You can even use taste and smell to tell something about your character, if you bring food that they would eat. The decadent smell of rum candied bacon, versus mild boiling rice around a campsite can really change the tone of the environment. Admittedly, food preferences is generally one of those parts of our characters that it is wise to have match our own, but if you like the kind of food your character would eat and your game allows you the time needed, sharing your character’s cuisine can be an interesting conversation starter! 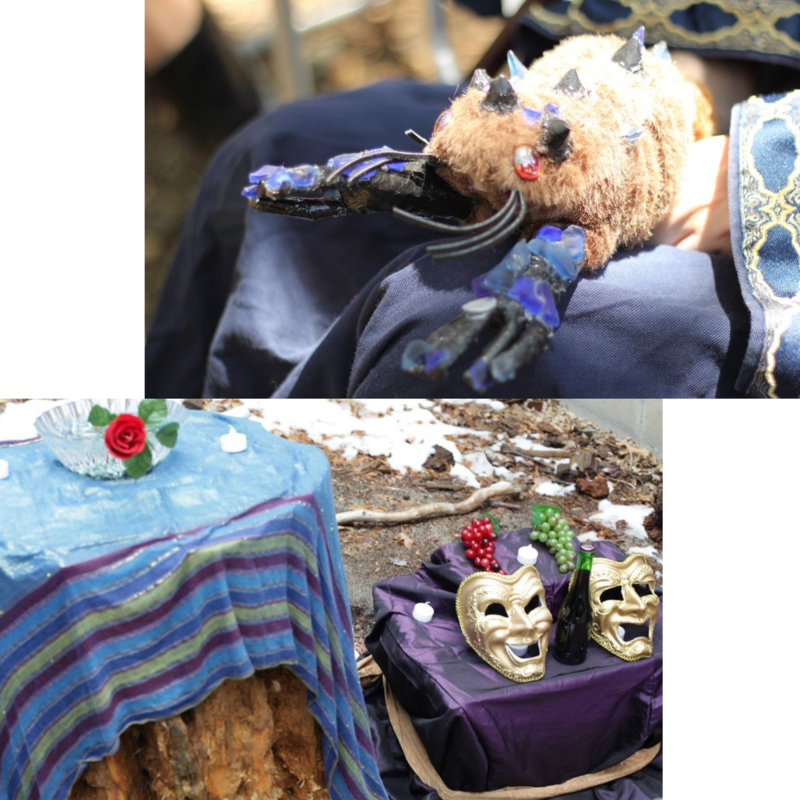 My favorite sensory story telling has got to be props [and when costumes become more like props]. I never fail to be impressed by the innovation and thrift of the Dying Kingdoms Art teams through the years. 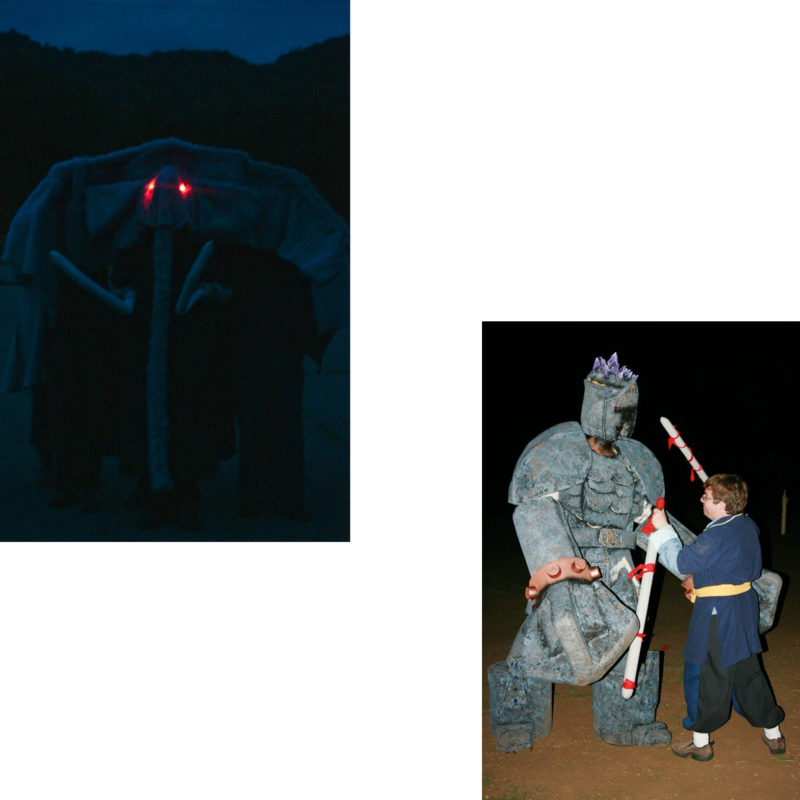 They have produced a 7 foot tall (mostly)combat safe stone golem, a giant furry mammoth, a man sized raven, and a blinking glowing comet from out of time and space that must have been nearly 3 feet across. Twin Mask also had fabulous props, though most of the ones I came across were smaller scale beauties, books and grimoires, and shrines to the in-fiction deities. So many people have helped make these things happen, and the passion and dedication they give so freely is truly inspiring! I’m sad that I wasn’t with Empty Thrones or Belegarth long enough to see what those folks would make! The Mammoth’s Tusks are boffer weapons held by one of the actors. The golem does just hit with it’s “fists”. An Amazing creature, and beautiful shrines from Twin Mask. When folks bring amazing things to game, whether they’re staff members or enthusiastic players, it inspires me to go the extra inch or mile and join in on making the environment more immersive, more fantastical. I may not always have the time or funds or space to produce the grand props or more elaborate costumes in my head. For example, I have this idea of using pvc scaffolding, faux fur, and some other things to make a seat-back for ground lounging at a campsite that looks like a napping yak, but uh, yeah, no space. Yet for every idea that I can’t bring to life there are others that I can, and the LARPing community has never failed as a source of inspiration. I have been incredibly blessed to meet some deeply amazing people through the venue of the various LARPS in my life. There are more people in these communities who deeply inspire and challenge me than I could possibly write articles about. But more than any individual I have to call out these communities as a whole. It is far too rare in life to find groups of people who welcome and reach out to newcomers and outsiders with open arms and floods of enthusiastic support. Yes sometimes, nerd rage, and high horses happen, we’re only human and sometimes our passions exceed our ability to communicate compassionately and effectively. More magical than any part of the stories told at their events, is the ability of those communities to recognize the inherent fragility and flawed nature of humanity and move forward with compassion and forgiveness when appropriate. This is not to say that they are complacent when it comes to protecting their members from dangerous elements, but that I’ve yet to see any of them come to the response of exclusion inappropriately.